Jayce was a happy toddler when his stepfather came into his life. Soon after, however, Jayce’s demeanor changed drastically. He became very angry and carried that emotion into elementary school, where his outbursts scared other children. At such a young age, Jayce could not verbalize what was wrong, so he acted out. His great-grandmother Ruth recalls the frightening influence Jayce’s stepfather had on him for a long time. Jayce, now seven years old, has had a tumultuous childhood. He bounced between Ruth’s and his mother’s custody for a number of years. When he was in his mother’s care as a toddler, he met his stepfather and that was when the trauma that led to his anger issues began. The abuse he suffered at the hands of his stepfather turned Jayce’s bright smile and sweet face into that of a complete stranger. His chose violent and hurtful tactics when he decided Jayce had done something wrong, such as wetting the bed. He would restrain him with duct tape as a punishment, among other cruel methods. This went on for years, and Ruth truly feared for Jayce’s life. Jayce returned to Ruth when he was five, and she helped him to receive the counseling she knew he desperately needed. He was later diagnosed with Post-Traumatic Stress Disorder (PTSD) as a result of the trauma he endured. A counselor at Jayce’s elementary school directed them to the Heartland Family Service Child & Family Center, which provides therapeutic counseling and treatment for children and their families. There, they were introduced to Becky Meline, Jayce’s current counselor. Jayce recently transferred schools and is thriving and using the coping skills he learned with Becky to manage his emotions. His bright smile is back, and his face lights up the most when he talks about his family’s two dogs. He will be entering the second grade this fall. When Jayce is not in school, he enjoys swimming and playing soccer. 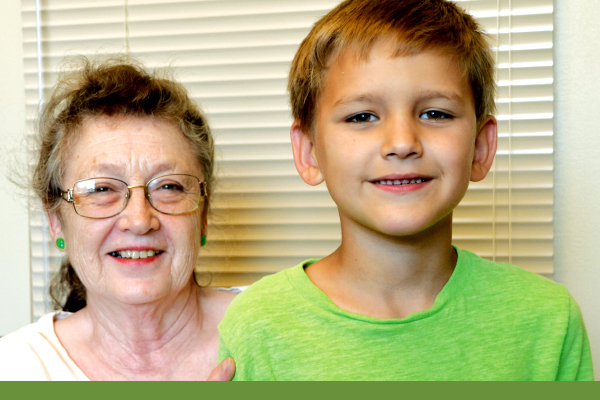 Ruth is thankful they were directed to Heartland Family Service and is very pleased at how well Jayce is doing.